This soup in its original form was a regular feature on my Mum’s winter menu as I was growing up. I seem to remember taking great effort to convince my younger brother that the rice vermicelli in it was dried eels brains … and for ages he believed me! Rotten sister! It is such a comforting winter food that it is still a favourite of mine. In a very large saucepan heat the oil. Add the onion and garlic and fry gently until the onions are golden. Add in the stock, stir well. Bring to a gentle simmer for 10 minutes. While the soup is simmering, take 2 of the tins of corn and place them in the food processor. Process until it fairly smooth. (You can just used 2 tins of creamed corn for ease if your diet allows, but the ‘extras’ in tins of creamed corn do not agree with Ellie). Add in the now creamed corn and the whole kernels of corn and stir well. Add in the broccoli here. Break up the rice vermicelli and add to the soup. Heat until noodles are soft and serve. This makes a very large quantity – love my giant 11L saucepan!! Go with a half batch if your saucepan isn’t quite so big! Hello lunch for the next month!! 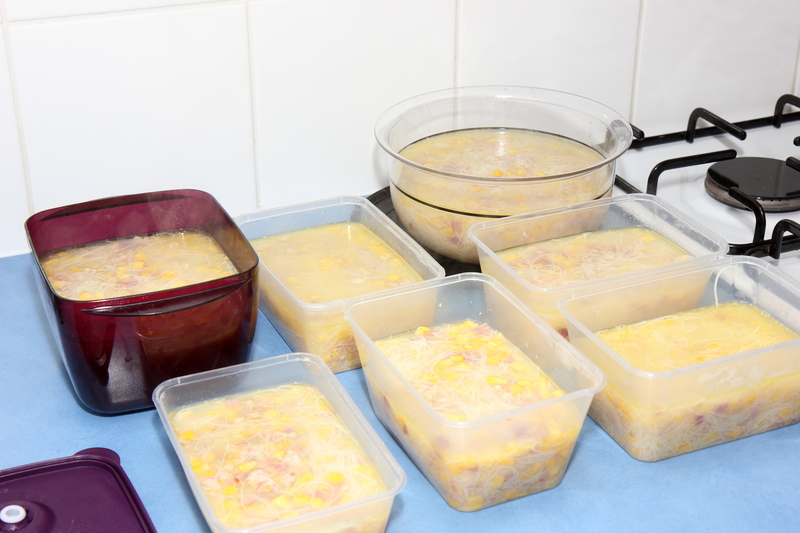 Soup freezes well and keeps in the fridge for about 4 or 5 days. *If you have some left over roast chicken it works really well here in place if the chicken thigh, just chop it and add it in at the same time as the corn and broccoli. Food that gives you a warm hug!!! Serious winter comfort – ours is loaded with broccoli at the moment.